Once in a while our boundaries are stretched. When this happens creatively, an artist could not wish for more. When Kristina contacted me for a special dance shoot, I did not really know what shape and form this experience was going to take. 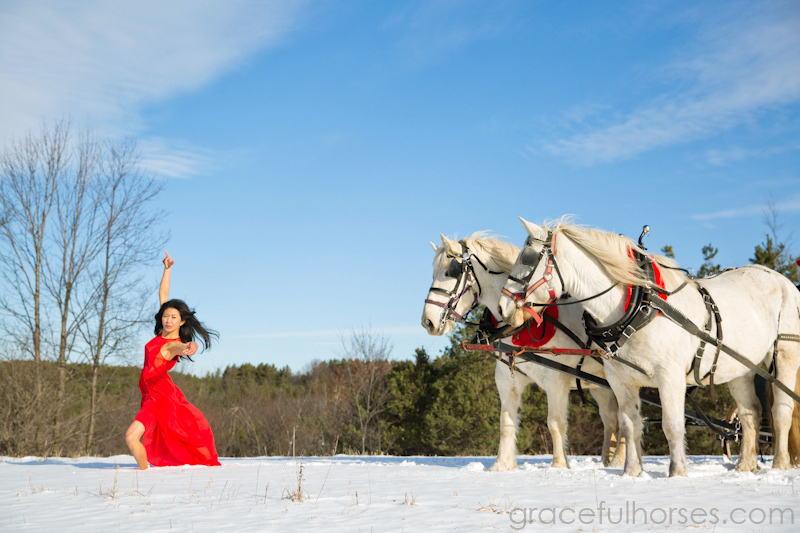 After our first chat, I started getting visions…of nature…snow…and ultimately, horses (hmmm…are you surprised???). Kristina seemed really taken with the idea and, whatever seemed a bit impossible a few weeks ago, came to life one beautiful snowy day. One thing led to another and I was impeccably guided to the right place: the fabulous Whinny Acres. Debbie, the owner, generously offered the property and horses to us and we just played…and played…until Kristina could not feel her feet anymore. Luckily, we had a little warm hut to go in and out of, so my model could graciously stand in front of the camera for a few minutes each time. Well…needless to say it was all worthwhile. We drove back home talking about every second of our adventure while being amazed and grateful for how it has unfolded for us. A serendipitous creative journey! Kristina: may these photographs bring smiles on your face every time you look at them. Debbie @ Whinny Acres: thank you…and hope to visit again soon! HAPPY NEW YEAR, may 2015 be brilliant and filled with wondrous adventures! Let’s all dance with the horses this year! Yours, Manuela. What a great journey indeed Manuela. Love love love your work! !